On a narrow beach of Virginia's Eastern Shore, a humble pile of broken seashells is changing the timeline of history. Broken pottery mixed in with the shells may be the oldest ceramic of its type yet found in eastern North America, archaeologists said, perhaps 1,000 years older than expected. In addition, the site tells a story of biological diversity, sea-level rise, and a trade network between coastal natives and the mound-building peoples of the Ohio Valley. The story is all coming out of middens, which are essentially prehistoric garbage piles. "The Savage Neck midden is a remarkable site," said Torben Rick, an archaeologist with the Smithsonian Institution's Department of Anthropology. "This site has really pointed us in an interesting direction." Professional and volunteer archaeologists from Virginia's Department of Historic Resources and the U.S. Forest Service's Passport in Time program have been excavating the site on the shore of the Chesapeake Bay for the past week. It was discovered several years ago, and the shells have been dated by Smithsonian researchers as about 3,000 years old. The pottery shards are made of clay mixed with tiny bits of crushed shells. That process, called tempering, kept the pots from shrinking or cracking as they were fired into ceramics. "People were crushing up shell and mixing it with their clay 2,800 years ago, which is much older than we thought," said Darrin Lowery, a geo-archaeologist and Smithsonian research associate who discovered the midden. Different methods can be used to date archaeological artifacts; not everyone agrees on the best way. Previously, shell-tempered pottery was thought to have originated no more than 2,000 years ago. The shell-dating method used by the Smithsonian moves it back an additional 1,000 years. "We've got a thousand-year problem there to deal with," said Mike Barber, Virginia's state archaeologist. "There are always more questions than answers." The pottery at Savage Neck is tempered with scallop shells, another unusual feature, as most such pots contain crushed oyster shells. "Biologists today say bay scallops never occurred in this location," Lowery said, "but archaeology says they did." Shell is still visible in some of the ceramic pieces. In others, the shell has leached away, leaving small, flat depressions in the hardened clay. The midden contains a wide variety of shells - hard clams, razor clams, scallops, whelk, soft-shell clams, periwinkles - an indicator of the area's diversity at the time, Lowery said. The site also contains shark's teeth that are millions of years old, which can be found today in layers of soil on high bluffs along the James, York and Rappahannock rivers. That's where they were 3,000 years ago, too, Lowery said. "A prehistoric person probably gathered them, canoed all the way across the Bay, and these fossil teeth were either cached or they were used and discarded in the midden," Lowery said. "More importantly, Native Americans were trading fossil shark teeth with mound-building folks in the Ohio Valley." Trade networks probably followed rivers from the Atlantic Coast to the Ohio Valley. 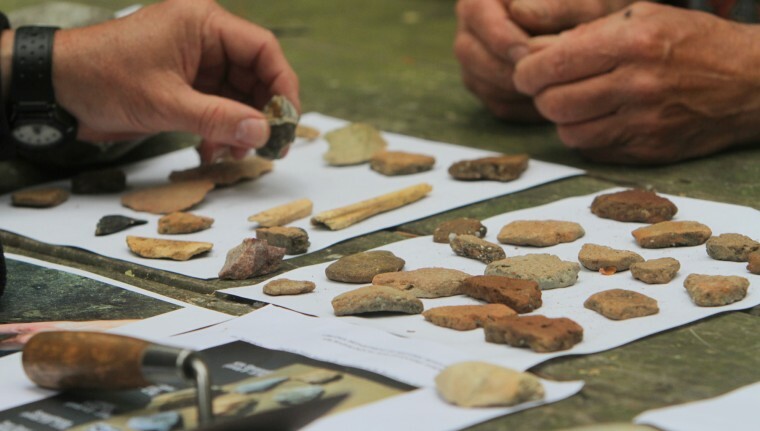 Artifacts from the mound-building culture have been found on the Eastern Shore, too, so the trade went both ways, he said. The populations also traded whelk shells, which were used to make beads and cups, he said. Particularly favored were left-handed whelks, whose spiral shells open on the left. When made into a cup, the long, narrow end of the shell extends to the right as a convenient handle. More than half of living whelks in the area around Savage Neck today are left-handed, Lowery said. The Savage Neck midden will probably disappear within a decade because of shoreline erosion and sea-level rise, he added: "Since the time that midden site was occupied, sea level has risen about 12 feet." Two of the excavation sites are actually underwater and can be worked only at low tide. The same is true for many such sites on the Eastern Shore, Lowery said. Work at the site has been partly funded by the Threatened Sites program of Virginia's historic resources department. "It's a race with the tides," said Mike Madden, archaeologist with the George Washington and Jefferson National Forests, who was at the site working with Passport in Time volunteers. "We're digging up dead people's trash."